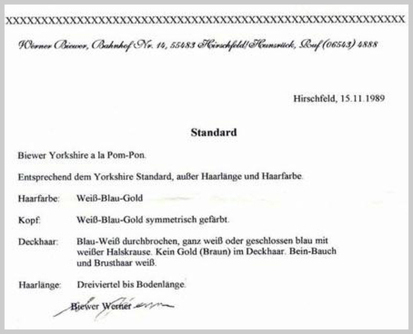 The Biewer Club Canada is working hard to educate the public about the German Biewer, a wonderful, toy dog breed. It will be the National Breed Clubs responsibility to preserve, protect and promote the breed. The Breed Standard in a registry are those characteristics that give recognition to a breed. They are largely applied to traits of physical appearance and visual distinctiveness. 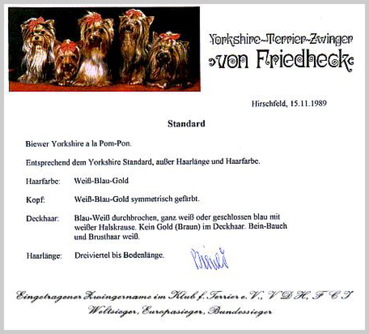 The Breed Standard, in respect of registry systems, should refer to the range of trait expression considered acceptable for the breed rather than the ideal animal. Breed standards may include certain performance characteristics and can also be expressed to include or exclude specific genetic conditions. Breed standards are the basis for recognition of the initial foundation stock of a distinct breed under the Animal Pedigree Act. This is the case for either a breed newly imported to Canada, or a breed which has newly evolved. Adherence to specific breed standards may continue to be enforced through the application of rules of eligibility for registration. This is especially common in newly established breeds, so that selection pressure gets directed towards helping generate a more uniform breed population, uniform and stable. Enforcing pedigree background may be the only criterion needed for eligibility for registration. This allows relatively more selection pressure to be put on economically important performance traits. Standards give uniqueness and recognition to a breed and are important to a registry and to producers of seed stock.